WINNIPEG – Buyers took advantage of the over 5,000 MLS® listings available at the beginning of September. As a result, sales were less than 3% off the best September recorded in 2011. The 2,364 new listings entered on MLS® during the month of September kept listings at a level not seen since 1997. Given such a competitive market with supply presently outstripping demand, there were price adjustments happening for a number of MLS® listings. MLS® dollar volume was still up 9%. It was the first time dollar volume in September went over $300 million. September MLS® unit sales increased 5% (1,182/1,123) while dollar volume rose 9% ($305.1 million/ $278.8 million) in comparison to the same month a year ago. Year-to-date MLS® sales are up less than 1% (10,278/10,234) while dollar volume has increased 4% ($2.75 billion/$2.64 billion) in comparison to the same period last year. MLS® listings entered on MLS® are up 12% to 18,846. Speaking of property types, condominium sales have slowed down somewhat in the past two months but remain up 8% for the year. 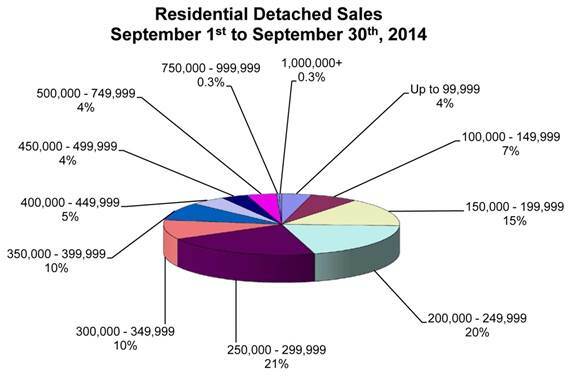 Residential-detached properties are slightly ahead of last year and helping them keep a lead was a 10% increase in September sales over September 2013. For residential-detached sales in September the most active price range was from $250,000 to $299,999 at 21% of total sales. Close on its heels was the next lower price range of $200,000 to $249,999at 20%. Even the $150,000 to $199,999 price range fared quite well in third place at 15%. The average days on market to sell a residential-detached property was 33 days, 2 days slower than last month and September 2013. The most active condominium price range was from $150,000 to $199,999 at 35% of total sales. A distant second was the $200,000 to $249,999 price range at 20% and then it falls back to 14% for the $250,000 to $299,999 price range. The average days on market for condominium sales was 40 days, 1 day quicker than last month and 10 days off the pace set in September 2013.